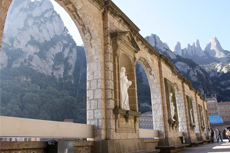 Take the pilgrimage from Barcelona to Montserrat, one of the most important spiritual and cultural centers in the region. "The Serrated Mountain" -- over 4,000 ft. high -- is a working monastery and is home to Benedictine monks. Beautiful tour with excellent guides and plenty of time to shop and see the area. Fantastic site, and we were there for a service, which added to the memorability of the time. Hidden treasure and we would highly recommend this tour. Hidden treasure and we would highly recommend this tour. The views are incredible. We were overwhelmed by the beauty of Montserrat. A 5 hour round trip with only 45 minutes there unfortunately as it was a beautiful place but no time to enjoy it. very nice excursion from Celebrity, very early morning arrived before the crowds. Basically a monastery up a mountain. Very interesting location and great buildings and architecture. Fabulous views and beautiful abbey! Excellent, informative guide. Abbey and art museum were fantastic. It was very cold when we traveled up to the Abbey. It was very cold when we traveled up to the Abbey. The clouds created a heavenly view. This was one of our favorite excursions! Excellent tour with amazing tour guide that enable us to get first to see and touch the "black virgin" without having to stand in a line (that took a hour by others). This may have been my favorite excursion. This may have been my favorite excursion. Montserrat is an amazing place. Loved seeing the monastery and the grounds. Loved seeing the monastery and the grounds. Beautiful and solemn place. A very pretty, historic place and well organized. A very pretty, historic place and well organized. The train was quite and engineering feat. It was a tour by bus and train. I wish we could have seen the cathedral more. This was our second time to take this tour. This was our second time to take this tour. The scenery on the drive to the monestary is spectacular and we enjoyed it just as much te second time. The sad part was it was a holiday and extra toursts/locals..
Montserrat is something that shouldn&apos;t be missed! Montserrat is something that shouldn&apos;t be missed! Absolutely beautiful although you should plan to get their early because it gets very crowded, especially depending on how many cruise ships are in port that day.